Cold Jet has been renting equipment and training operators for 15 years. We have the largest rental fleet in the country, and the most experienced operators. If you have a rental need you have come to the right place. Cold Jet Australia Pty. Ltd. has the largest rental fleet of dry ice blasting equipment in the country. 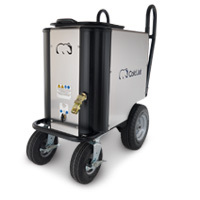 Cold Jet's robust and patent protected blast systems provide easy operation for the novice, as well as maximum performance and aggression for the experienced user. Cold Jet encourages potential purchasers to try before they buy. It is the first thing we tell anyone considering using or buying another type of dry ice blaster. Take the time to organise a head-to-head comparison. Dry ice blasters are not all the same. 10 minutes with the worlds best equipment and there will be no doubt which equipment you want as part of your business. We can provide plenty of references of customers who have tried the others and bought the best. Cold Jet have provided rental equipment and training for over 15 years, we have the experience to be able to quickly pass on the basics for safe and efficient use for a first timer; and with the most experienced contract cleaning team in the country we can also offer you the most detailed advice on specific applications, including time and material estimates. Our oldest equipment is available for as little as $500 per month on a long term agreement. We also offer the very latest equipment for short term rental (weekly), or anywhere in between. Call us now for more information. 1300 COLDJET, +61 2 9600 9570.